Buveur D'Air is surely reaching the upper echelons of the best two-mile hurdlers seen in recent years after he swatted away young pretender Samcro to win a second BetVictor Fighting Fifth Hurdle at Newcastle. Persistent rain did nothing to dampen the enthusiasm of the huge north-east crowd at Gosforth Park, as they came in their droves to witness the best race in the division outside of the spring festivals for many a season. With Nicky Henderson's seven-year-old aiming for an 11th straight win, the general consensus was he would face a tougher task than he did in winning the last two Champion Hurdles. That was because not only was he facing Supreme Novices' Hurdle winner Summerville Boy, but also the great Irish hope Samcro, behind whom there was an infectious confidence - so much so he was sent off the 6-5 favourite. As a result Buveur D'Air went out to 11-8 - the biggest price he had been sent off since winning his first championship. Jack Kennedy set out to make all on Gordon Elliott's Samcro - and while he had gone fast enough to see off Summerville Boy by the third-last, Buveur D'Air and Barry Geraghty were motionless in the wings. Despite flattening the last, the champion sprinted clear to win by eight lengths and is now generally odds-on to emulate his owner JP McManus' previous great Istabraq by winning three Champion Hurdles. Henderson was a nervous onlooker from Newbury, where he said: "I think it was relief more than anything. After the bloody nose with Might Bite (Betfair Chase) last Saturday, I was prepared for a second one. "He wasn't at his best in last year's Champion Hurdle - he didn't go to Aintree or anywhere else after it, it knocked him around. I don't think he was right at the time, and it's great to see him come back and do that." Assessing future plans, the Seven Barrows trainer said: "I can't see why he won't do Christmas Hurdle, somewhere - and you know where in March. The dream is still alive." Geraghty said: "Samcro set a nice even pace, and I thought he would have made it more of a test. 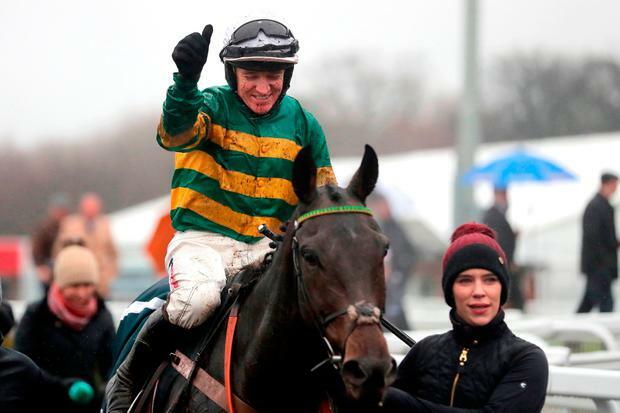 "He's very good - he's a dual Champion Hurdle winner. I only rode him in one of those, but any horse who wins two Champion Hurdles deserves respect - and he's winning everywhere he goes. He is top class and a pleasure to ride. "You'd like to think the wind op made a difference. It was far more of a test today, but he got into a good rhythm so it was great." Proud owner JP McManus said: "That was pleasing. I have an awful lot of respect for Samcro, so I was hoping he'd do that. Barry seemed to be happy enough all the way. "Nicky gave him the wind op in the summer and says that helped him enormously. I didn't back him - I was just happy to see him win. "Istabraq was a different generation, so I wouldn't like to compare them. Istabraq was very special to me - and so is Buveur D'Air. "He's such an electric jumper, magic over them." Gordon Elliott was magnanimous in defeat and said of Samcro: "The best won. No matter what tactics we tried, that would have been the result. I'm still going to train him for the Champion Hurdle - we can't back down now." When asked how Samcro could find the eight lengths he was beaten, Elliott said: "A miracle. Listen, we'll need an awful lot of luck, but we decided we'd train him for the Champion - and that is what we'll do. "We came over here to try to take him on, and he just showed how good he is. Buveur D'Air was excellent, and we've no excuses." Tom George said of the well-beaten Summerville Boy: "This time last year he was beaten at Stratford, so all is not lost yet." There was a sad postscript to the race when it emerged that Bleu Et Rouge, who had fallen at the fourth-last, suffered a fatal injury.